During half-term we were privileged to be able to tour the facilities at CERN. CERN is described as the largest particle physics laboratory in the world. CERN, the European Organization for Nuclear Research is one of the world’s largest and most respected centres for scientific research. Its business is fundamental physics, finding out what the Universe is made of and how it works. At CERN, the world’s largest and most complex scientific instruments are used to study the basic constituents of matter — the fundamental particles. By studying what happens when these particles collide, physicists learn about the laws of Nature. We began our day at the Globe which is an interactive exhibition about the world of particles and origin of our universe. After the Globe we spent a short time in Microcosm, which is an interactive gallery allowing students to investigate the history of our exploration of the atom. We were privileged to be able to have our lunch in the CERN restaurant where all the staff, including the research physicists, eats. It was wonderful to be able to listen to them discuss their work. We began our CERN tour with a video about what CERN is all about. The next stop was to see ATLAS. ATLAS is one of two general-purpose detectors at the LHC. It investigates a wide range of physics, including the search for the Higgs boson, extra dimensions, and particles that could make up dark matter. ATLAS records sets of measurements on the particles created in collisions - their paths, energies, and their identities. This is accomplished in ATLAS through six different detecting subsystems that identify particles and measure their momentum and energy. The interactions in the ATLAS detectors create an enormous dataflow. To digest these data, ATLAS needs a very advanced trigger and data acquisition system, and a large computing system. More than 2900 scientists from 172 institutes in 37 countries work on the ATLAS experiment. Size: 46 m long, 25 m high and 25 m wide. 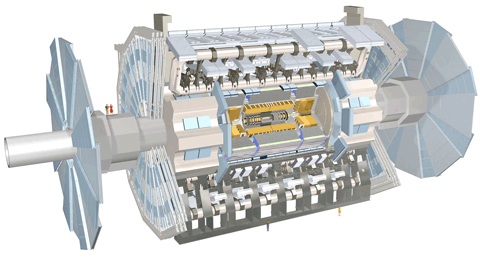 The ATLAS detector is the largest volume particle detector ever constructed. Please don’t feed the physicists. ATLAS research. Watching a 3D film of the building of ATLAS. Outside ATLAS with our fantastic guide Valls Velasco (third from left). He is currently doing a PhD at ATLAS. Dr Anthony Hare is on the far right. We were then taken to SM18, the magnet test centre, where all the superconducting magnets for the LHC were tested and measured before being installed underground. Magnets are used to keep the subatomic particles in the correct path before they are allowed to collide. The end of our visit. Leslie has provided his own CERN hard hat. Dinner at the end of a wonderful day. We all tried the typical Swiss fondue. We would like to thank Valls for our excellent tour of CERN! We would also like to thank Dr. Anthony Hare for accompanying us on the tour, Mrs Downey and Mrs Edwards for looking after the administration and Equity travel for arranging our travel and accommodation.